Design and information technology are strongly complementary fields. Together, they provide a powerful combination of highly valuable skills and knowledge. You might combine a specialisation in Communication Design with an Interactive media major in Information Technology adding to the strength and relevance of each. You might focus your Industrial Design on the creation of 'smart' products and sophisticated interactive tools, or the next generation of gaming devices or wearable technologies. This combination of creativity and cutting edge technology will challenge you to link your lateral thinking and problem-solving skills. It will help you to create innovative products and compelling imagery using the latest technologies. the Bachelor of Information Technology (majoring in Business Information Systems, Computer Networks and Security, Interactive Media, Games Development or Software Development). You will gain all the benefits of each degree course (see Bachelor of Design / Bachelor of Information Technology) and be fully equipped to pursue a career in either field separately or to combine the two in your chosen work. Our way of life is strongly influenced by the sophisticated products and imagery that help us to connect. Communication design industries now expect graduates to be skilled across many media and ways of thinking. In addition, designers and developers of new games, interactive media and software can take advantage of the roles and developed skills in the design disciplines. Branding, typography and illustration, as well as industrial design products, offer new approaches and fresh ideas through their translation to the digital space. Monash is committed to admissions transparency. View the ATAR and student profiles for this course. In this course, you can choose from the following majors, extended majors and minors. Some are only available as minors or only in certain locations, so click through to see the full details. You need to satisfy the following entrance requirements to be considered for entry to this course. All applicants must satisfy the following prerequisites or their equivalents. Units 3 & 4: a study score of at least 30 in English (EAL) or 25 in English other than EAL. All applicants must satisfy the equivalence of the VCE subject prerequisites. VET Certificate IV, diploma or advanced diploma graduates: To be considered, applicants will normally require at least 60% average. Preference will be given to students whose prior studies are related to the course in which they are seeking admission. Programs that involve competency-based assessment without grades or marks will not meet the admission requirements. This course uses the entire academic record as part of its selection considerations. University: Two single units at an Australian higher education institution satisfy minimum entry requirements, but more units may be useful for selection, especially in areas of study related to the course in which admission is being sought. Applicants who have successfully completed Year 12 are eligible to apply for this course. Applicants with no formal secondary or tertiary qualifications are not eligible to apply for this course. This course uses the entire academic record as part of its selection considerations. For other domestic and international qualification entry requirements and scores for this course use the study credit and admissions eligibility search. Applicants must also meet the English language requirements. Minimum entrance requirements for admission to Monash University Australia. Applications for on campus studies should be made online through the Victorian Tertiary Admissions Centre. This course is not available for Second Semester (July) entry. 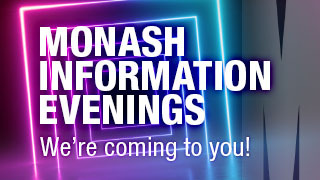 You may apply to transfer from another Monash course. Transfers are a competitive process. You may apply mid-year for available courses however consideration will be given as to whether you will be able to follow your course progression. Fees are subject to change annually. Note: see information on how average fee is calculated. defer payment through the HECS HELP loan scheme. Fees are per 48 credit points which represents a standard full-time course load for a year. We offer over 360 types of scholarships, valued at up to $280,000. Some scholarships offer one-off payments while others continue for the length of your course. Learn more about Monash Scholarships. The Student Services and Amenities Fee applies to some students each calendar year. Double degree courses allow you to study towards two different degrees at the same time, and graduate with two separate qualifications. And because a required subject in one course can count as an elective in the other, our double degrees take two years less than if you studied for the two degrees separately. The Bachelor of Design is a specialist course that develops through theme studies in History and theory, Drawing foundation, and Design studios specific to each of the specialisations. These will come together in the form of a graduand exhibition normally developed during the final two studio units in the third year of the course. History and theory units will equip you with the skills necessary to research design issues, and enable you to contextualise your own practice and communicate ideas and strategies. Through the prism of history, you will begin to situate the place of design in society by referencing pivotal art, design and architecture movements. Later units address issues of culture, society and specific design themes. This will assist you to develop the practical and intellectual skills required by art, design and architecture students in the discipline of drawing. This is the component of the course through which you will develop key skills and concepts particular to your design discipline. In the communication design studio units you will undertake a focussed exploration of a range of media and elements including typography, image, layout, two and three-dimensional design, interactivity, sound and motion as core components to their communication design solutions. Studio-based projects across both print and digital media platforms will develop skills in narrative structure, typography, image construction and manipulation, interactive communication processes, production methods and technologies, and the planning and management of design outcomes. In the industrial design studio units you will undertake a focussed exploration of the range of issues, skills and techniques vital to the realisation of user-centred design. Through industrial design projects, you will learn about topics such as visualisation techniques, ergonomics, materials, production methods and technologies. This will provide you with foundation skills and knowledge for your IT education and ensure a breadth of understanding of IT and its applications in organizations and society. This will provide you with a focused program of study that will develop your expertise in one area of Information technology. You will develop the practical and theoretical skills and knowledge in your chosen major needed to successfully plan, develop, implement and evaluate information products and systems.